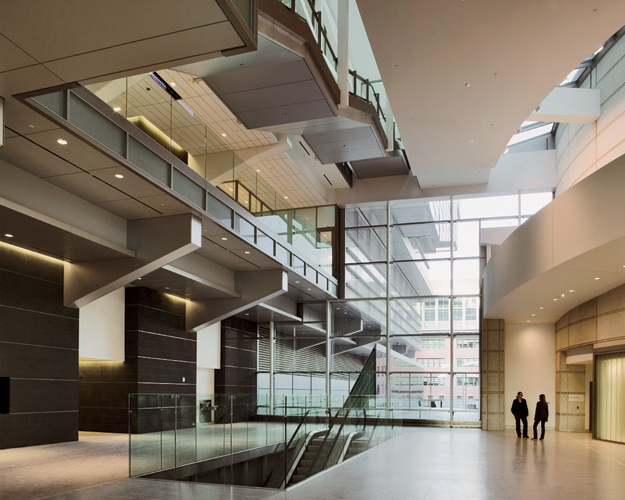 by Rafael Vinoly and DMJM Architects and located on a three block site, is part of the New York City Master Plan for New York’s Courts. 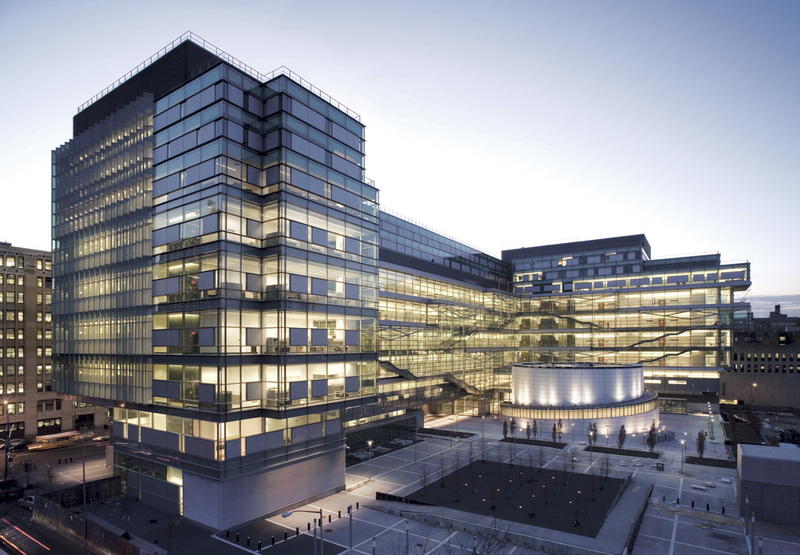 The program consists of seventy-two elements for Supreme and Criminal Court agencies, with 47 courtrooms and judges’ suites for the Supreme Criminal Court, a 645-seat jury assembly area, District Attorney offices, a law library, court facility offices for the NYPD, several contract agencies and the civic plaza that covers an underground parking structure for 400 cars, is landscaped and occupied by the Jury Assembly Hall.Ronnette Riley Architect’s responsibilities included space planning for the various program requirements, a sustainable interiors study, and specifying and designing furniture for these spaces. 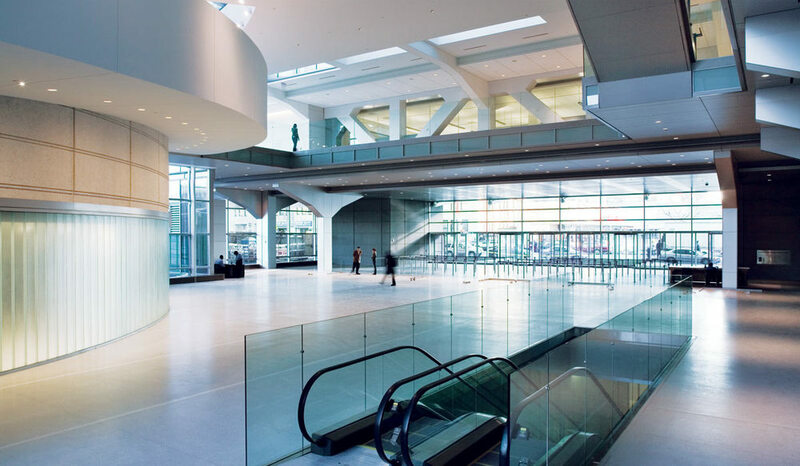 In a break from the traditional, the building is sleek and contemporary with glass curtain walls, terrazzo tile floor, metal details, perforating metal ceiling, and natural toned beech veneer. 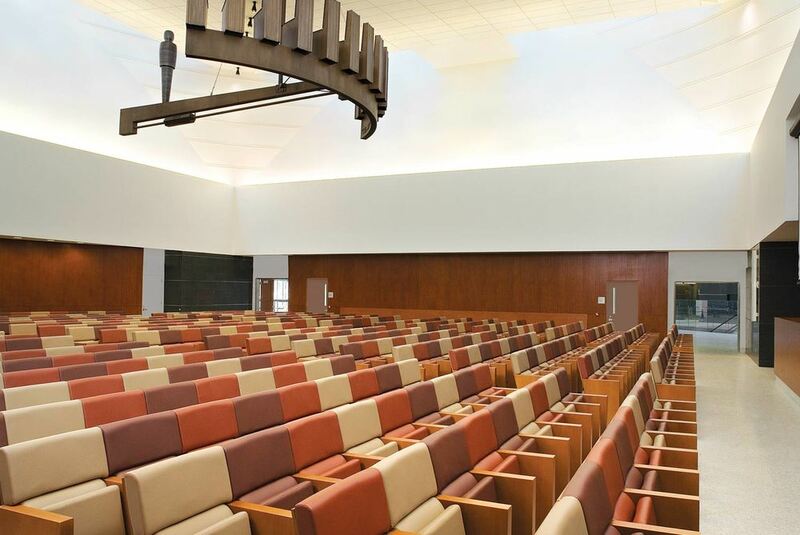 According the interior, furnishings, and mill work, are modern, with tapered forms, polished chrome detailing, natural wood finishes, and costume furniture including courtroom benches, conference tables, and library furniture. 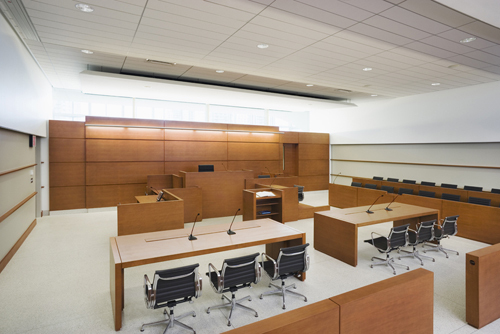 to remodel 21 courtrooms of various sizes and 21 Judges Chambers of The Richard J. Daronco Westchester County Courthouse in White Plains, New York. RRA’s scope an responsibility covered approximately 25,800 square feet and eighteen to twenty million dollars of the 280,000 square foot rehabilitation. Our goal was to retain as much of the existing conditions in the 1970’s design as possible and also create a space that thoughtfully integrated new materials. The project began with an initial site verification and thorough piece-by-piece cataloging of all existing furniture and finishes. We salvaged and refinished the classic jury, spectator seating, attorney’s tables and chairs and gave special consideration to the sustainability of new elements. 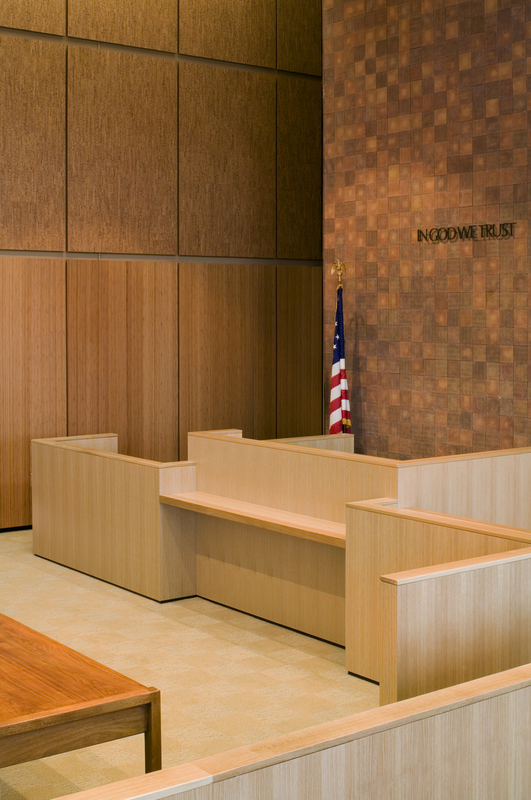 In addition to these aesthetic choices, RRA ensured that the design would fulfill the security and safety requirements of the court system, meet ADA requirements, and that the seating would retain the traditional hierarchy of the judicial system. 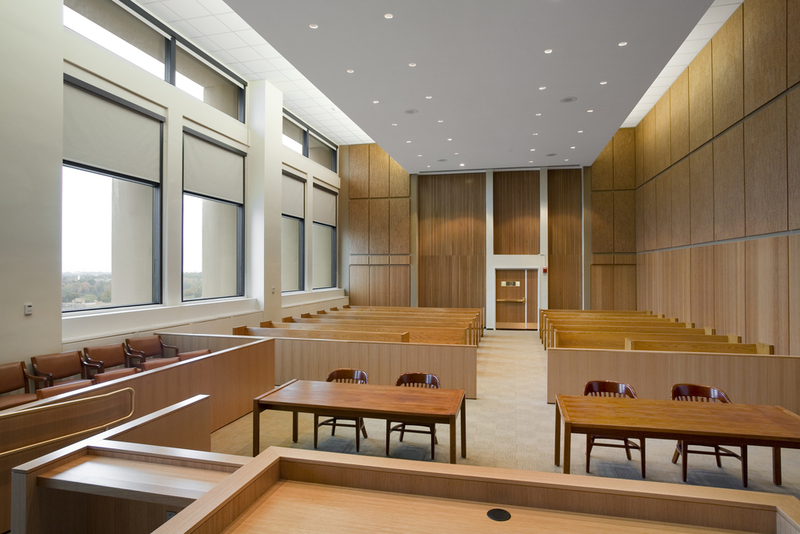 Currently nine courtrooms have been renovated and the entire project is scheduled to be completed near the end of 2007.
for the National Guard. 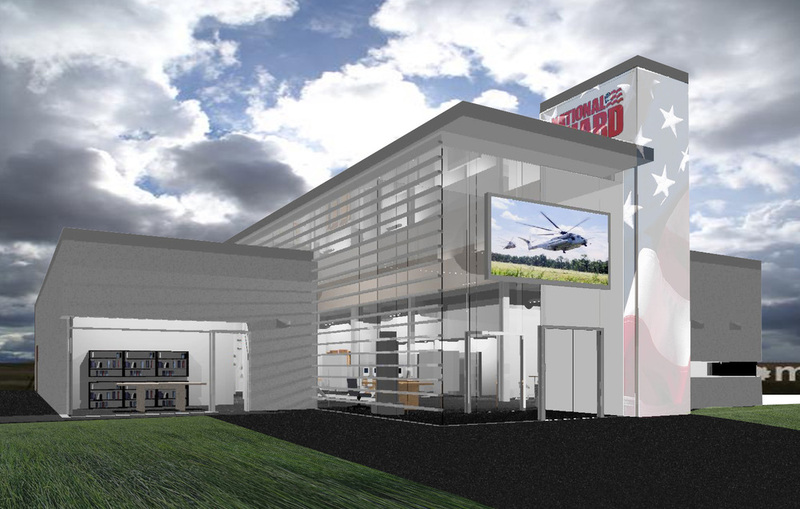 The client requested prototype design for a hypothetical strip mall site and a freestanding building site with parking. Information and recruitment stations would be central to each location, and then various other facilities would be worked in according to the size of individual sites. Examples of these additional facilities include a climbing wall, fitness equipment, music stations to download songs, a cafe, a theater, and an interactive gaming area.To appeal to young people, RRA blended a retro, industrial feel with photovoltaic cells and passive solar energy, and played wood and natural materials against cutting edge, interactive technology. was Relocated from an alcove off the building’s north entrance that was actually part of the airlock for the lobby, the 450sf CityStore was looking to increase its image as much as it increased its display area. The design challenge was to complete the designed construction within 5 weeks. Our role was to design a space for the CityStore that would begin to create a brand for the store and to get as much of the merchandise on display as possible while working within a budget that made this the most inexpensive retail space our office has ever worked on. We proportioned the store around the large, west-facing window, using it as the back area of the cashwrap so as to not lose any opportunity for display. Using only slatwall, formica, vinyl flooring and paint we mixed the color palette of each to create blocks and areas within the space and on the walls. A thin, floating gypsum board panel hangs over the cashwrap as the only ceiling structure introduced into the space. The benefits of the new CityStore location allows the client to display the full line of city codes and merchandise goods in a brightly-lit, cheerful space, it’s design ties closely to the brand image that they want to project and, most importantly, sales are up dramatically.